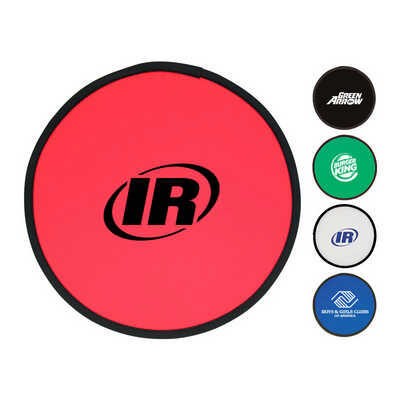 This fold-up flying disc is made of soft nylon and wire which allows for easy folding. The fold-up flying disc comes with a pouch (unassembled) of the same colour. Note: Due to the nature of the product, the round shape may change from use or during shipping. One or two colour print only. Colours: Red, Blue, Green, Black or?White with Black Trim, Dimension: 254mm dia. / 76mm folded. Price includes : 3 Day Service* Screen / Pad Imprint - One Colour/Location. Setup is included.